This year’s global theme for International Woman’s Day is #BalanceForBetter, with a focus on building a gender-balanced world. Creating a gender balance across tech teams is a challenge that needs to be addressed and I believe it’s important that we focus on attracting, retaining and nurturing a diverse range of people across our own teams at the UKHO. With this, it’s great to see that there’s lots being done by the organisation to try and address this balance, with several Diversity and Inclusion (D&I) initiatives helping to transform attitudes and encourage staff to consider the impact of D&I on every decision they take. At the heart of these efforts is our Women’s Network. The Women’s Network started life as a steering group focused on influencing change on behalf of women at the UKHO. Open to all people at the UKHO, the group works closely with our senior management team to improve our culture and make the UKHO a diverse and equal workplace. This has included working with our fantastic HR team to create a returnship scheme and developing gender neutral job ads. In addition to this, we host meetings, training and networking sessions to help create a positive and supportive work environment for women in the organisation. 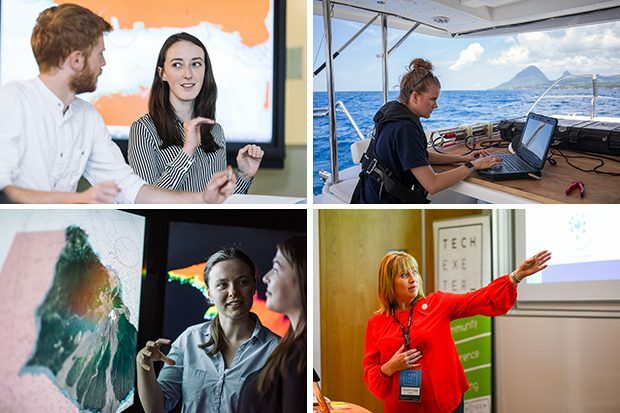 This has included a series of talks to help build women’s confidence in tech and senior roles, with lectures delivered by Marion Leslie of Thompson Reuters, Alison Henwood of Shell (both on our board), Sally Basker CEO of Exeter Science Park and Jo McKeegan-Brown who is head of the MOD Unarmed Guard. We also have lots of inspirational women at the UKHO. Jo Funnell, one of our project managers, recently gave a fantastic talk on her experience delivering the UKHO’s new Headquarters in Taunton. Jo shared her past qualification for the role, as well as her challenges both professionally and personally, whilst she worked towards delivering her vision. It was great to see how proud she was of what she and her team had delivered and rightly so, we are now all enjoying the benefits of working in such a fantastic building! Celebrating women’s achievements, raising awareness against bias and taking action for equality are agendas we can get behind. So this year we also hosted International Women’s Day events at the UKHO to support the campaign. This started with a live stream of the Everywoman in Tech Forum, which included talks from leading female role models on the power of diversity. We also hosted a stand in our atrium, where members of the network shared information with staff to raise awareness of unconscious bias and how the UKHO can move forward with their goal of improving a gender-balanced workforce. We know that a lot of unconscious bias stems from stereotypes, and that by highlighting positive female role models and experiences we can start to erode this. We also know that doubt, fear, and lack of confidence can be combated with encouragement & support. I am proud to be one of the many allies at the UKHO who support strength in diversity, which in turn leads to strength in our teamwork, innovation, energy and delivery. We have lots in the pipeline and we will continue to invite internal and external inspirational women to our regular events. We will also start putting in place our ‘networking mesh’ to expand women’s networks and introduce them to others who have experience in the areas they wish to develop. Want to find out more about what we're doing in digital, data and technology across the UKHO? Subscribe to our blog here.